Why is Science Under Fire? Science is under fire in the U.S. Congress, and a central line of attack is to cut funds for Federally supported research. Whether such attacks are motivated by ideological opposition to specific research areas, or a desire to decrease government spending by cutting programs that Members of Congress deem to be “wasteful”, reducing research funding is harmful to women’s health. Advocates must push back and defend the value of agencies such as the National Institutes of Health (NIH) and the National Science Foundation (NSF). Federally funded research makes important contributions to the development of evidence-based health interventions and addresses topics that private sector research is not interested in. It produces scientific knowledge and evidence that feeds the on-going innovation necessary for breakthroughs in prevention, treatment, and cure of a wide range of diseases, health conditions, and concerns. Even in hard economic times, scientific research is a sound investment that benefits patients, consumers, public health, and the U.S. economy alike. Sadly, media coverage failed to report that this research has the very real potential to benefit millions of women who suffer from hot flashes. Hot flashes affect as many as three out of four women going through the menopausal transition; severe hot flashes are extremely disruptive to a woman’s daily life, and may cause months of sleeplessness, with the worst sufferers experiencing dozens each day. 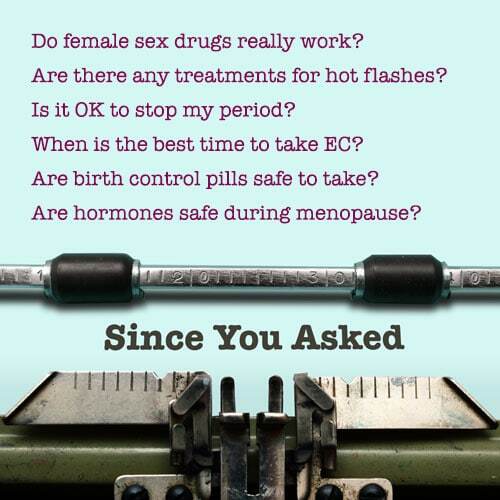 The only hot flash treatment that has been approved by the Food and Drug Administration (FDA) is hormone therapy, but research shows that even short-term use of these drugs carries some health risk due to the increased risk of heart disease and stroke emerges within the first year. Women who wish to avoid those risks are anxious to find safe, effective alternatives for treating hot flashes. Preliminary research has found that integral yoga’s breathing techniques may help reduce hot flashes. This is appealing to some women, but drug companies and medical device manufacturers – the private sector companies that conduct health research – have no incentive to spend their money on research to demonstrate the effectiveness of treatments that can’t be turned into products for sale. Federally supported research is needed to identify alternatives that are effective for women while being safer than hormones or other drugs. A strong portfolio of publically funded research is needed to supplement the product-development focus of industry-funded research. Without support from public agencies like the NIH, this promising lead for treating hot flashes would likely languish in the pages of medical journals, never reaching the millions of women who could benefit from it, if research proves this intervention works. In addition to blocking progress on important women’s health research topics, Congressional attacks on grant awards made by Federal science agencies raise broader concerns about political interference with scientific research. Representative Issa’s yoga amendment was just one of several recent Congressional proposals cutting very specific NIH grants, such as grants to study condom use, which is critical to HIV/AIDS prevention. These attacks bear a striking resemblance to proposals put forward nearly 10 years ago by then-Congressman (now Senator) Pat Toomey (R-PA), an opponent of reproductive and gay rights. Toomey periodically attempted to eliminate specific NIH-funded research projects on sexual behavior, homosexuality, and other areas of inquiry that ran afoul of his conservative political agenda. These political attempts to micromanage research are harmful and unnecessary because NIH uses a rigorous and highly respected peer review process to decide what research projects it will fund. NIH’s peer review relies on the knowledge and critical analytic skills of panels of scientific experts who evaluate the scientific value of proposed research. The agency’s process, which is recognized internationally as the gold standard of scientific integrity and research evaluation, ensures the merit of not only research conducted at the NIH but also the grants it makes to external researchers. NIH-supported research has led to scientific and medical discoveries that have benefitted millions of American woman and their families, including the home pregnancy test. Sadly, Congressional attacks on scientific agencies are not limited to the NIH. In April 2011, Senator Tom Coburn (R-OK) released a report that accused the NSF of “fraud, waste and abuse” and called for fundamental reform of the agency’s grant-making priorities. The report is deeply flawed in both its analysis of current NSF grant-making and its recommendations. It alleges that the NSF is guilty of “mismanagement” because it spent $3 billion on “questionable” studies; examples include research on racism in on-line dating, the relationship between gender and housework, and the impact of socialization on gender roles children assume. These studies were selected through a rigorous peer review process similar to the NIH’s process. Knowledgeable scientists with expertise in behavioral research evaluated these proposals and concluded not only that they examine issues associated with important social issues, but also that public health and welfare would benefit from the knowledge gained from these areas of study. Senator Coburn’s attack (like Representative Issa’s on the NIH) is based on the premise that he, as a politician, is better qualified to judge the value of such research than the scientific experts. Coburn’s report further criticizes the NSF for supporting “redundant” research. Senator Coburn identified this problem by searching the NSF’s website for the word “energy.” Because this search revealed that the NSF had made approximately 1,000 grants related to energy research, Coburn concluded that NSF grant-making duplicates the Department of Energy’s (DOE), and is wasteful. This slapdash process would not pass muster with the NSF’s grant review panels! The report did not attempt to determine whether the NSF’s energy-related research grants might explore important issues in ways that complement the work funded by the DOE. Of course, Senator Coburn has a strong interest in energy-related work since his state, Oklahoma, collects hundreds of millions from oil production tax revenues. Finally, Senator Coburn recommended that NSF improve its grant-making by funding only “transformative science”, science that will advance the field. While this sounds reasonable, the suggestion actually highlights Coburn’s fundamental lack of understanding of the realities of scientific research. Until scientists develop a tool for accurately predicting the future, it’s impossible to only fund research that is assured to dramatically advance science. The scientific research community has, however, developed a tool that it believes is highly effective in determining what research is most likely to have a transformative effect and advance the field – that tool is peer review of potential studies! In the current Congress, it seems that any vote can be turned into an attack on either women or government, or both. This lack of respect for both women and the scientific process must not go unanswered. Opposition to specific research projects based on political ideology rather than scientific merit detracts from the country’s ability to improve critical public health outcomes. Politically-imposed restrictions and political pressure that limits research or scientific inquiry threaten not only women’s health and well-being but also the productivity and integrity of U.S. research agencies.